This article in the January 4th, 2014 New York Times reports on the tragic case (the "Oakland Case") of a 13-year-old girl who suffered complications from elective surgery in early December 2013, whose condition deteriorated and who has been declared brain dead. While it is not articulated directly in the article, her parents appear to object to the medico-legal conceptualization of brain death and they wish to force the hospital to continue to provide care for her. A judge has placed an injunction against the hospital, prohibiting them from removing her from life support (in this case, this most likely means mechanical ventilation) until Tuesday January 8th, 2014. The medical establishment at the hospital where she is/was a patient has clearly taken the path of defending the concept of brain death and their rights and responsibilities under the laws concerning brain death -they have refused to insert a tracheostomy or a permanent feeding tube into the girl - and they may have, and we may be tempted to, ascribe her parents' behavior to anger, grief, bereavement, etc. But I think this case illuminates some broader issues about bioethics, brain death, and organ procurement. For those unfamiliar with the medico-legal definitions, brain death is a diagnosis that is made after severe brain damage from a variety of insults. It is a very specific diagnosis that is based on a host of physical examination techniques and sometimes corroborating diagnostic studies, and it means that there is evidence of irreversible cessation of ALL brain function that has been caused by total lack of blood flow to the brain. A patient who is declared brain dead is legally dead. I have diagnosed brain death dozens of times. The medical mantra is that, properly diagnosed brain death always means that there is NO brain function and that "real death" (that is, cessation of heartbeat) will inevitably ensue in coming weeks or months as the body cannot continue to function without brain function. But isn't this interesting! That we need to reassure people that "real death" will inevitably ensue seems to reveal that we recognize that brain death is not real death, but that it will, after time lead to real death! (Of course, all paths lead to real death, eventually.). Clearly this landscape is fertile ground for cognitive dissonance. Let's explore why. When I tell a family that their relative is brain dead, and thus legally dead, I expect incredulity. Why? BECAUSE THEY'RE WATCHING THE MONITOR! They know there's a heartbeat. They know there's a blood pressure. They know that the air is going in and out and the blood is going round and round. And they know the patient is warm. They know s/he's alive in the traditional, intuitive, folkloric sense. And I'm gonna have to explain why I've just diagnosed him/her as dead. I'm going to have to tiptoe around and hem and haw and beat around the bush and use analogies, etc. Because brain death is not intuitive like real death. It's counterintuitive. Because it's a legalistic invention created to serve other purposes. The origins of the laws concerning brain death can be traced to the late 1960s and the Harvard Study Group. Two things were changing at that time. Firstly, the ability to support failing organs was advancing by leaps and bounds, with kidney dialysis, ECMO (the Bramson Membrane Lung), mechanical ventilation etc. Secondly, the first organ transplants were being performed. Ideally, an organ is alive at the time of transplantation. If it comes from a dead (cadaveric) donor, it doesn't work as well. But taking vital organs from living people is tantamount to murder. A work-around was needed. That work-around was the invention of the concept of "brain death". Now we could have our cake and eat it too. "Live" organs that function as live organs from "dead" patients (who, except for the brain, function as live patients) with no accusations of homocide (except in rare circumstances.) There are several reasons why this concept of brain death is a specious one that comes into conflict with other imperatives, as in the Oakland Case. The first that strikes me is the Kantian perspective (among others) that a person must be treated as an end in themselves, not as a means to another end (organ transplantation). Alternatively, primum non nocere, "first do no harm" (a biomedical ethics principle, also called non-malfeasance), would prohibit practitioners from removing the organs of a living person. But, we've worked around all this! We have "legally" declared the brain dead person a corpse, so Kant's moral imperatives (the categorical imperative) and biomedical ethics have been circumvented, legally. But you can imagine a person saying " I don't care what the law says, that's just a legal technicality, this person is alive!" And if that is a person's position (as it appears to be in the Oakland Case), one can easily understand why moral outrage might be the response. The next, the most nettlesome to me, is that this definition defies logic, and the consistency that logic requires. We're calling a person dead so we can keep their organs alive for transplant? Oh, the irony! Here's a thought experiment - if the organs are dead, by virtue of the legal declaration, does it follow that a person receiving a heart from a brain dead donor is in fact dead, because her beating heart is, technically, "dead" and has been legally declared dead? This is not to be facetious. Once you artificially manipulate the rules, you can have all sorts of silly results if you otherwise continue to employ the rules of logic. Next, we have undermined millennia of human intuition and understanding about what it means to be dead or alive. Perhaps the end justifies the means. Perhaps this definition was required because of the advances in life support which simultaneously drastically changed the natural history of almost all human diseases and human death in developed countries. But it should nonetheless give us pause, if only to consider the difficulties our legal contortions pose for peoples of more traditional cultures or with more traditional beliefs. I remember that in New Mexico, getting Navajo people to understand brain death was quite a challenge. There are many other things that a person could say about slippery slopes and the like, that would rehash some of the original deliberations about brain death and I won't get into them here. Others would quickly point out the lives that have been saved by organs from brain dead donors. Others would point out that our utilization of life support in cases where there is consensus that there is little value has gotten out of hand. I am one of those people. But the fact that we have found a "solution" to the problem of futile care in the case of brain death does not mean that that solution does not create it's own set of problems. My goal here is to illuminate some of those problems. Under this light, it is perhaps understandable why the parents in the Oakland Case are struggling so much. It's not necessarily that they're too emotional or intellectually incapable of understanding - perhaps it's that the definition of brain death is too morally strained and dubious. Maybe while those grief-stricken parents come to grips with the loss of their daughter, the rational, intellectual doctors in Oakland should examine the premises they take for granted and realize that brain death is not real death - no matter what the law says. Another thought occurred to me: Suppose you oppose the Kantian perspective, and believe that sometimes a person can/should be used as a means to another end. Therefore, a person can be used for their organs to benefit others. It likewise follows that that same person can be used as an end to their parents' emotional fulfillment. And keeping Jahi alive to appease and console her parents, if only by symbolic life, should be acceptable. What makes your definition of death (cardiac arrest) the 'real' definition while brain death is an invented one? Both involve measuring the function of one organ which, if not functioning, will lead to all the cells of the body ceasing to function. Why do you consider a kidney (consisting of living kidney cells) taken from someone whose heart has stopped differently from a kidney (also consisting of living cells) taken from someone with no brain function? The "problem" that anonymous (I hope anonymous is not a hacker) has identified has been settled in the last two years. 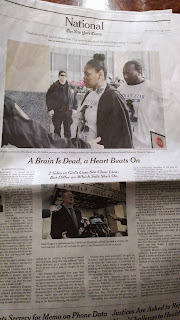 Jahi's other organs have survived "sans brain" if you are willing to accept that her brain is indeed dead two years later, so now, unless we accept that the brain has special primacy, Jahi is still alive, albeit with one dead organ. The same could be said of a person on dialysis, or a patient with an "artificial" heart, or a patient on ECMO, and perhaps others. See how prickly this is? How Kafkaesque? I could place primacy on, say, the thyroid - and say if your thyroid is dead, you're dead. Call it "thyroid death." That's absurd, you said? How is it? Have we all agreed that the brain has primacy? Where is that agreement? Let's say we do agree that the brain has primacy - I will extend you the courtesy of thinking up situations where that could lead to problems - where we say that the function of the brain is what is required for human life. Are there any moral problems that may stem from such a definition of human life? If you cannot think of them, I will list some for you. And if indeed, "real" cardiac death always follows "invented" brain death after the ventilator is removed, I say fine. Remove the ventilator. When the heart stops, you may have the organs. For the majority of human history cardiac death has been the only form of death we could reliably measure. That doesn't make it any more 'real' than brain death. Brain death has always existed, its only recently we have been able to identify it and artificially separate it from cardiac death. You could certainly use the term thyroid death if you wanted to. Not sure what sort of situation it would be useful in. I don't see the huge moral problems with having brain death be one of the primary definitions of death. I'm sure you can come up with exceptional scenarios though. Fine. By extension, all patients on dialysis are legally dead on the basis of death and non-function of a vital organ. Is "anonymous" OK with that? Shall we round up dialysis patients, declare them dead, and harvest their organs for the sake of others with "dead" organs (hence they're dead) whom we now care more about? Oh, what a predicament! I have tried not to state my summary positions in these posts and comments. I have preferred that it remain a kind of "Socratic Method" forum for dissecting and elaborating these issues. You have touched on some of the key issues. In keeping with my goals, I will dilute my thoughts to this: if brain death is "good enough" a substitute for declaring death, well I can think of some others. I just wish we could accept the limitations and leeway we have allowed for brain death and extend them to other scenarios. I also kinda wish that we could be more honest about the moral implications of brain death. Because I do believe that they are more nuanced than we have generally articulated. It is only after we grapple with these moral nuances of brain death that we can have a more general discussion of medical futility and what it means to be dead or alive in the context of medical technology. I think the problem is that you think of death as a term with an absolute meaning, and that brain death and cardiac death are just means of determining 'real death'. That isn't true at all. 'Death' is an extremely ambiguous term that has little scientific meaning. Brain death and cardiac death are more accurate terms that reflect things that can actually be measured. They are not methods of determining death (whatever that means), they are states in their own right. Someone who is brain dead may not have reached cardiac death. Someone who has no heartbeat may not be brain dead. Which one of them is 'really dead'? Neither, because 'real death' is a meaningless term. OK, fine. Then let's say that "death" occurs when the totality of a person's integrated organ systems cannot be supported with medical technology. So, if your kidneys "die" you're "dead" so long as we cannot support the rest of the integrated organ systems with a technology such as dialysis. With dialysis, the other organs are supported. Dialysis patients are therefore "alive". And, as of 2016, ventilation and enteral feeding have, in spite of a "dead brain" (now arguable) led to the survival of the rest of Jahi's integrated organ systems. So, she's alive too. I'm sorry folks, but the concept of brain death is falling apart. There are solutions which can restore logical consistency, but they have not yet gained any traction.